Twenty players participated in the opening event in the 2016 BMAB (UK) Season, which comprises six tournaments all at the same venue near East Midlands Airport. This tournament was kindly sponsored by Dale Taylor who donated monies towards trophies, certificates and added prize money. Dale and Lawrence Powell were awarded with special “300 Club” loyalty badges to commemorate their participation in five tournaments, thus achieving over 300 experience points. They join Peter Bennet, Tim Cross, Julian Fetterlein and Tariq Siddiqi who have already joined the club. The usual format of a truncated round robin with six rounds of 11 point matches was adopted. After the first day, Peter Bennet and Cecilia Sparke were the only two players unbeaten after three rounds of play. 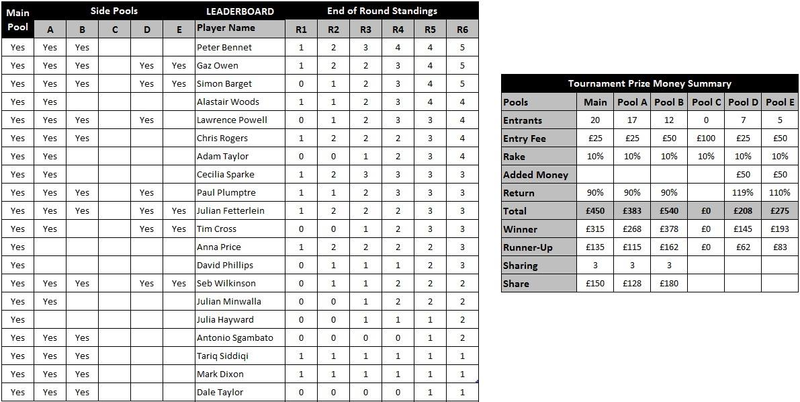 Over the second day however, both players had lost matches, and after the final round three players were tied at the top of the leaderboard: Simon Barget, Peter Bennet and Gaz Owen. In accordance with the tournament rules the three players shared the prize money from the main-pool and relevant side-pools and the chose to play a one-point match shootout rather than throw dice for the honour of winning the tournament. In this “Good, the Bad and the Ugly” type the ever cool cigar smoking Peter Bennet triumphed – his second BMAB (UK) Tournament victory. Gaz was runner-up and Simon in third place. Congratulations to these worthy winners and to all participants for making the tournament a great success. I would like to make a special thank you to David Phillips, who in participating in his first BMAB tournament, showed himself to be a very courteous and sporting player, fitting in perfectly with the pleasant club-like atmosphere of the BMAB (UK) tournaments. Further to part 1 of this report, the transcription work is now completed for all 60 matches together with detailed analysis with XG. The overall results are shown on the attached table. 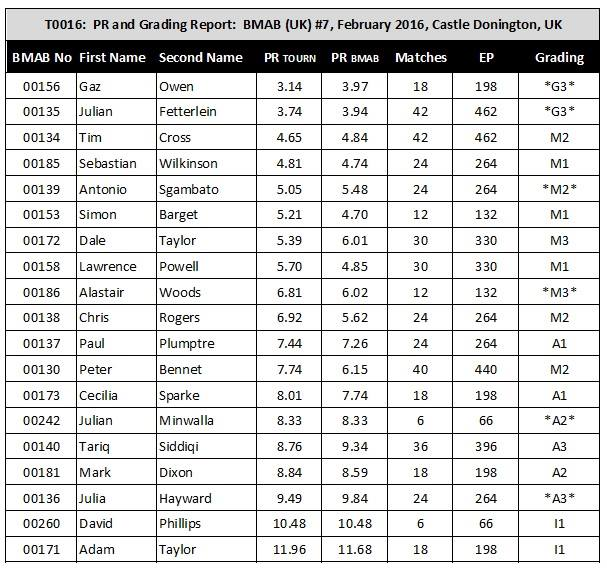 As reported previously, Gaz Owen won the PR prize with a tremendous score of 3.14, with Julian Fetterlein taking the runner-up position with an excellent 3.74. 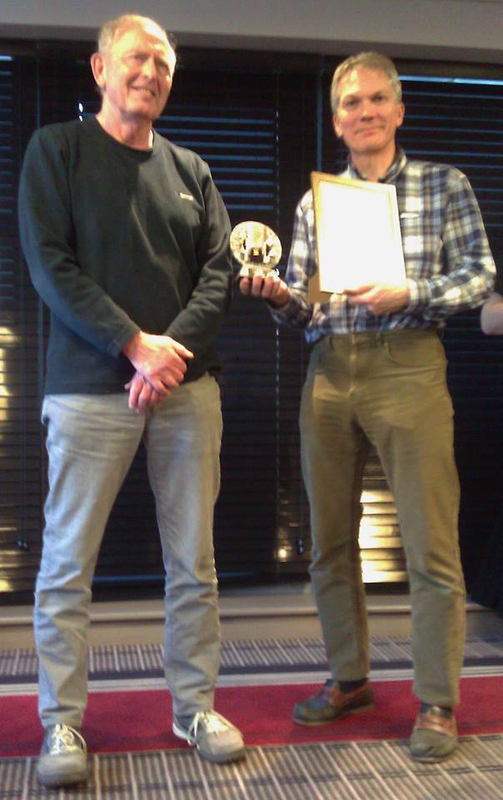 (In the fourth BMAB (UK) tournament in August last year, Julian had achieved an astonishing PR of 3.01). Both players have achieved Grandmaster (Class 3) titles by virtue of excellent performances at this and previous BMAB (UK) tournaments. Congratulations to Julian and Gaz for reaching this prestigious level. Tim Cross achieved the third best PR with 4.65, reducing his aggregate score to 4.84, moving him ever closer to the Master (Class 1) level. Sebastian Wilkinson, with his PR of 4.81, in 4th place, maintains his consistently high level of performance. Antonio Sgambato achieved the fifth best PR with 5.05, reducing his aggregates score to 5.48 and earning himself an upgrade to Master (Class 2). 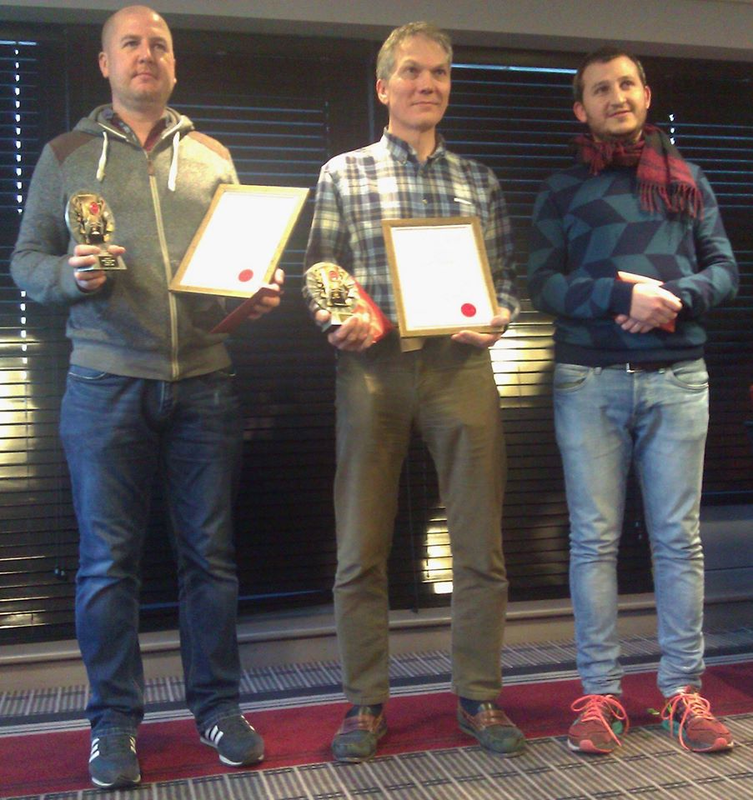 Alastair Woods, Julian Minwalla and Julia Hayward also earned upgrades to Master (Class 3), Advanced (Class2) and Advanced (Class 3) respectively. Congratulations to all these players for their significant achievements. As a final note, I would like to thank the match transcribers, Michael Roumeliotis, Julian Fetterlein, Alastair Woods, Sebastian Wilkinson, Jon Barnes, Cecilia Sparke, Julia Hayward and Simon Barget for their very professional work. Similarly, I would like to thank Alastair together with Bernhard Mayr, from Austria, and Bruce Farquahar, from Canada, for each independently analysing the 60 match files.